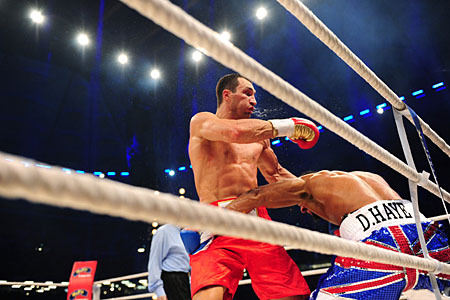 The biggest heavyweight title fight in years wasn’t an instant classic as IBF/WBO/IBO heavyweight champion Wladimir Klitschko (55-3, 49 KOs) scored a one-sided twelve round unanimous decision over cautious WBA champion David Haye (25-2, 23 KOs) on Saturday night at the Imtech Arena in Hamburg, Germany. 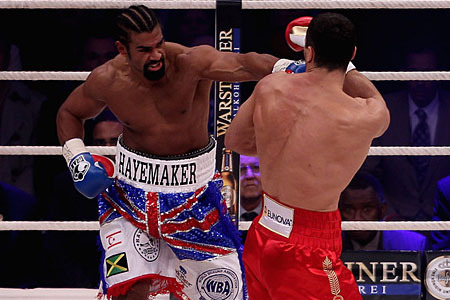 In round one, Haye threw lots of power punches but didn’t land clean. Wlad landed some jabs but nothing hard. More connects in round two for both and things heated up further in round three. 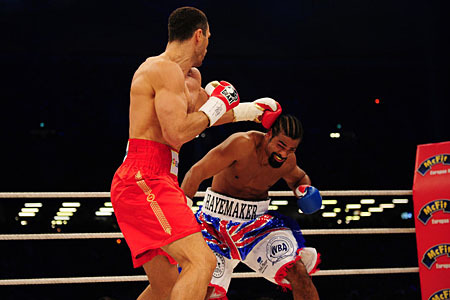 Haye landed a clean shot at the bell to end round four. 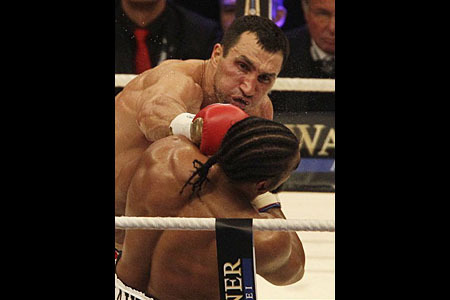 Good combination by Klitschko in round five. 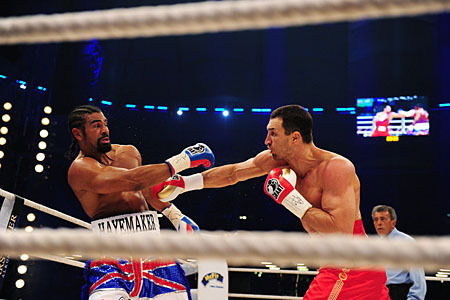 Haye stayed mostly on the outside, occasionally jumping in with single shots. 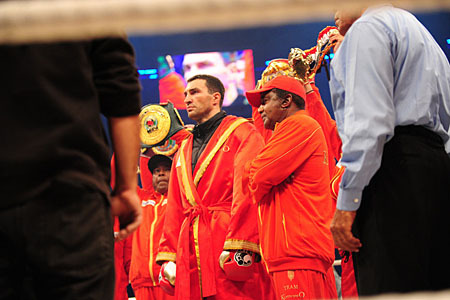 Klitschko pressed the action and was busier in every round. 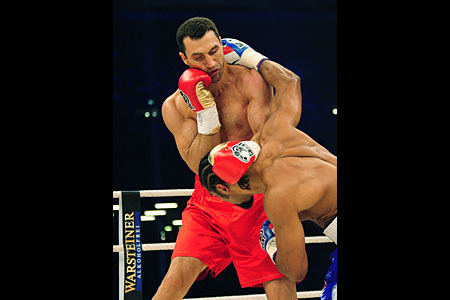 Klitschko was deducted a point by Geno Rodriguez for pushing down Haye in round eight, but took control down the stretch. Rodriguez gave Haye a count after he went down in the eleventh. 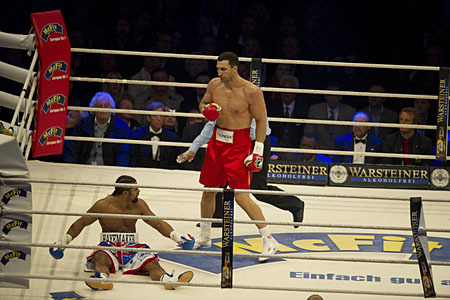 Haye landed a hard shot in the twelfth, but Wlad came back. In the end, scores were 117-109, 118-108, 116-110. 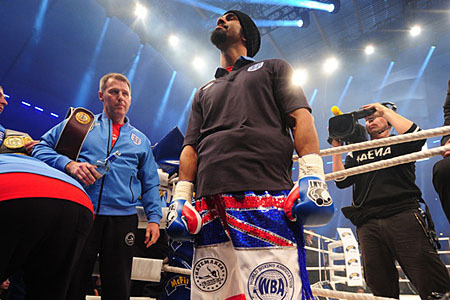 Haye attributed his poor performance to a broken toe that he says he suffered in training three weeks ago. WBO #3/WBA #5/IBF #9/WBC#11 cruiserweight contender Ola Afolabi (17-2-3, 8 KOs) stopped Terry Dunstan (24-4, 14 KOs) in the first round of a clash for the WBO Intercontinental belt. Unbeaten bantamweight Ashley Sexton (11-0-2, 5 KOs) was held to an eight round draw against Mike Robinson (4-2-2, 0 KOs). Scores were 78-76, 75-77, 76-76. For all the latest boxing news, click here. All contents copyright 1999, 2000, 2001, 2002, 2003, 2004, 2005, 2006, 2007, 2008, 2009, 2010, 2011 by Freitag Marketing Services, LLC. The information on this site cannot be reused without written permission.